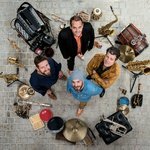 With a wealth of experience in a wide range of musical backgrounds the four members of 'Ndiaz come together to realise their vision of dance-inducing, acoustic trance music; a blend of sounds drawing on Brazilian forró, Middle Eastern jazz, Indian rhythms and Romanian doina, skilfully distilled through a Breton filter. 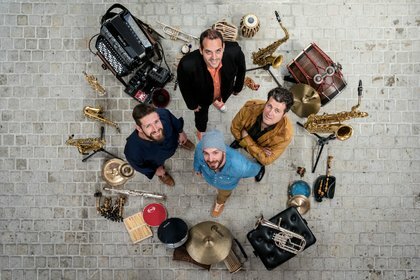 Trumpeter, bombardista, flautist and tuba player, Youn Kamm was formerly a member of digital folk experimentalists Alembig Electric and also plays with Ibrahim Maalouf; percussionist Jerome Kerihuel studied his art in India and has played with many leading Breton artists; saxophonist Timothée Le Bour is a ubiquitous presence in many projects as well as his Le Bour-Bodros group; accordionist Yann Le Corre unites traditions of Brazil and Brittany. 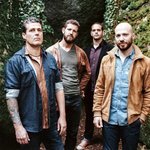 Together, their singular sound has become a highlight of the major fest-noz gatherings in Brittany and further afield. 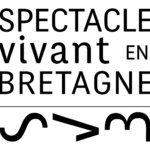 'Ndiaz is supported by Spectacle Vivant en Bretagne.